We believe that Shakespeare is accessible. To everyone. We think that some of the ways he has been presented to the public and students through his 400 year old history belie that notion, but we know that, with some pretty simple tools (which I will discuss below), audiences can thrill to his language, identify with the characters he created, and find joy in the feeling that they get it. Since January, I have had the enormous privilege of working, or rather, playing with a group of young people who are in the autism spectrum. Every Tuesday afternoon, we get together and see what we can create together. We play theatre games, tell one-word and one-sentence stories collaboratively, and figure out what strengths each of us brings to the others. As challenging as these students’ lives are when they aren’t with their peers in ASPIRE, when we are together, we find a lot to value and enjoy. Tomorrow, they will come to the playhouse and see where the professionals do their work (or, play). Just as our work with the Parks and Recreation department this spring is teaching us, children are ready and eager to tackle what Shakespeare’s text offers, and to learn about themselves by investing time in collaborating with others. Here are some of the approaches we are taking to keep Shakespeare available to these groups, and to teachers, and to superfans, and to our fellow theatre lovers and practitioners. 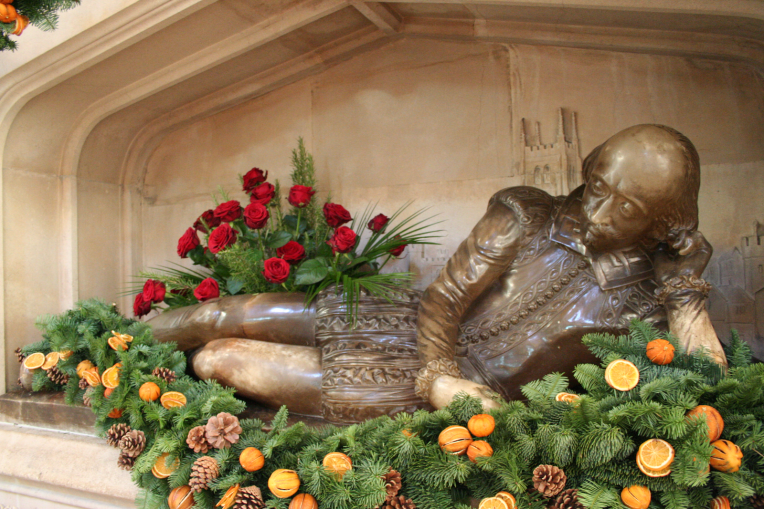 Bring Shakespeare down from his pedestal. Think about Shakespeare as an actual person who lived and worked and played. In the 19th century, a trope sprung up around Shakespeare that misplaced him in the world of the luxurious poets of that time, not his own. This statue at Southwark Cathedral is emblematic of that notion. He lies prone, thinking (with that gigantic pate), coming up with the beautiful poetry we all worship. NO! Shakespeare worked for a living (he liked money and saved enough to buy the second biggest house in his hometown). He worked in the theatre. He wrote for specific people, people he knew. They were his collaborators, maybe his friends. He lived in an apartment near work. He was litigious as all get out. He had a wife and children–one of whom passed away as a child. He felt the effects of politics (see Aubrey’s article on rhetoric and living under a female monarch). He commuted long distances. While he had Hamlet say “He was a man take him for all in all, I shall not look upon his like again,” we can rest assured that we have seen his like and can hope to see more who are excellent collaborators, who think speedily and with structure, who appeal widely across neuro-, ability-, socially-, or culturally- diverse populations. Turn and keep the lights on. One of my great joys in considering Shakespeare and the stage he wrote for is how everytime I see a performance, or look at a passage with playing in mind, I discover something I hadn’t thought of before. Last week, we welcomed Kent State students to the playhouse for some workshops and performances. The workshop I was delighted to lead featured Katie Little and Brandon Carter in a scene from Henry IV, Part 1. The Ren Season production–in which the actors direct themselves, come up with their own look for costuming, and work in tight production parameters–is as close as we get to the way Shakespeare’s company worked. And it makes for some amazing, persuasive, and eye-opening choices. Carter, as Hal, and Little, as Poins, play the relationship romantically–and why not. We know they meet in a tavern most often, we don’t have another love interest for Hal until the end of Henry V, and there is the textual “My sweet, Honey Lord” which seems pretty darn suggestive. 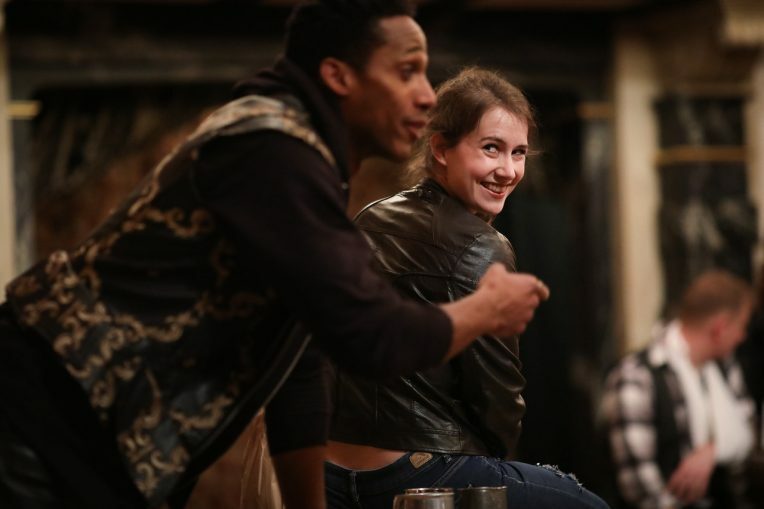 Brandon Carter and Katie Little in Henry IV, Part 1 2019. Photo by Lindsey Walters. Because of how they have been exploring this relationship in the play, I knew that I wanted to work with the scene when I had the chance. Or, rather, I knew I wanted to give some students the chance to play with it. So, we talked about rhetoric (see ROADS to Rhetoric in our ASC study guides and our cards available here), embedded stage directions, and audience address, and then the students huddled and gave suggestions for specific moments in the scene (see the Google Doc worksheet) . They encouraged Katie to seize the opportunity given by her character’s word choices (leave, lay) to reveal her intent a line or two earlier than she had been–reinforcing the big choices she’s already made. They suggested that Carter take a line to the audience “Who? I rob? I a thief? Not I, by my faith.”, creating a moment of alliance that let the audience into the story a bit earlier. These, and other suggestions the students came up with, changed the scene in subtle and not-so-subtle ways and created moments that excited audience and actors alike. As we discussed the outcomes at the end of our session, we realized that the hour long workshop was more time than the scene had in all of the rehearsal prior to opening. And the choices the students came up with were valid and were valued–and, who knows, were maybe even deployed in the show later that night. Small bites = Big understanding. You will note that the scene referenced above is short–at 57 lines of prose, it is somewhere around three minutes of stage time (at ASC, we clock 20 verse lines as around 1 minute of stage time). Yet, we spent an hour playing with it. And we put three very specific lenses on that exploration so that the students were able to focus on the possibilities of their assigned area (which we changed throughout the hour–same text, new focus each time through). This is what we call “going fishing” or “Deep and Narrow Analysis” (DNA, because we love acronyms). We want to give our students and participants enough text to play, but not so much they can’t really explore.In the end, it makes their critical reading and viewing of the next scene they tackle so much deeper. They learn in small chunks and then process in big, deep ways of understanding. They see how to think like an actor, they have the language to both examine and discuss possibilities and choices, they gain confidence in their ability to understand complicated texts. They feel so smart. And they are. Not because Shakespeare is inherently difficult, but because that is our received knowledge. But, when we keep these ideas in mind, we empower all audiences –those of the reading or playing variety–to see the ways in, out and through these characters and moments. I hope this month will be an opportunity to think about the ways you are like Shakespeare, and the ways your students can own his plays. And, also, that you’ll think about coming back to the playhouse while the ASC actors are in their element and running the show during our Winter Season: The Actors’ Renaissance. It is something to behold. Something not to be missed. 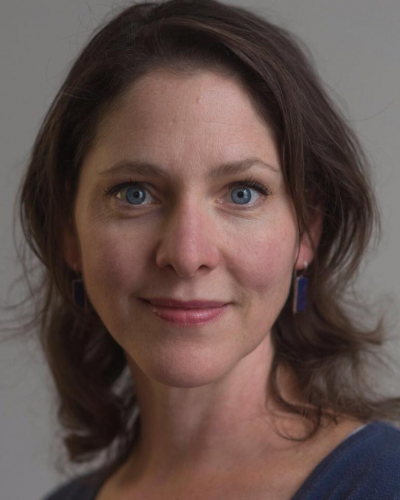 Sarah is the Director of Education and holds a Master of Fine Arts and a Master of Letters from Mary Baldwin’s Shakespeare and Performance Program.